THE MODERN BARN: An amazing single-story property located on a one-acre private property. A modern property close to shopping, dining, golf and entertainment. The Barn has all the conveniences of home! From the outside it may look like a barn but inside you’ll find special design touches like exposed brick, galvanized metal wainscotting, industrial light and wall fixtures, tile floors and a vaulted barn-wood ceiling. FULL KITCHEN: The kitchen has everything you need to cook and enjoy meals including all cookware, bakeware, pots, pans, utensils as well as brand new appliances (full-size stainless steel refrigerator, dishwasher, stove and oven, microwave), toaster and an automatic coffee maker. EATING AREA: The kitchen breakfast bar has seating for three and there is also an outdoor dining area located on the covered patio. 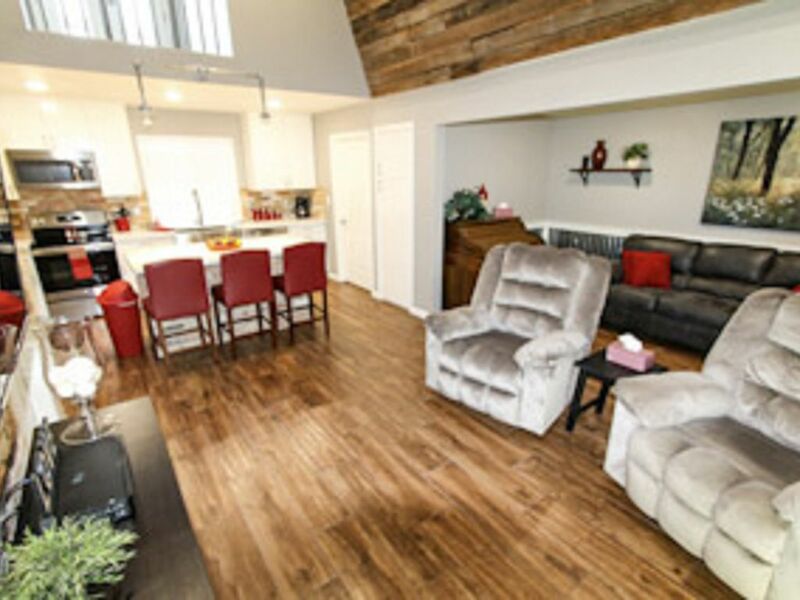 LIVING ROOM: The living room has a large HD flat screen smart TV and two brand new electric recliners as well as a large comfy couch that's terrific for lounging around, watching TV or napping. The ADA compliant bathroom is very spacious & has a walk-in shower with hand grips, a sink/vanity with granite countertop, two medicine cabinets, tile floor. We provide hand towels, bath towels and washcloths for you. BEDROOM/SLEEPING ACCOMMODATIONS: The bedroom is very comfortably appointed with a King-size bed (brand new Sealy Posturepedic mattress), ceiling fan, large closet, tall boy dresser, and nightstand. For additional sleeping accommodations, the living room couch pulls out to make a full-sized bed. We supply all bed linens, pillows, and blankets. LAUNDRY ROOM: The laundry room has a full-size washer and dryer, an iron and an ironing board, a vacuum cleaner and plenty of clothes hangers. We provide a starter supply of laundry pods and dryer sheets for you to use during your stay. In the heart of Gilbert, Close to freeways that can take you all over the Valley, Unique Property, Big Screen HD TV, King-Size Bed, Free High-Speed WIFI, Covered Parking, Private Spa, Outdoor Dining & Fire-pit, Full-Stocked Kitchen, Electric Recliners, hair dryer, Washer & Dryer, All Linens, Pillows & Towels provided. The Barn has its own private yard with a spa, a propane Barbeque grill, firepit and patio furniture for you to enjoy outdoor dining. There is covered parking right in front of the barn for a maximum of two vehicles. There is also additional parking available (non-covered) for RV's or Trailers for an additional fee but it must be requested in advance. Hookups for RV's and Trailers are not available. This property is located at Gilbert & Ray Road in a quiet residential neighborhood that is just 10 minutes from downtown Gilbert, the Santan Regional Outdoor Mall and Western Sky Golf Resort! What's around there? We have lot's of grocery stores, upscale restaurants and casual dining restaurants. This neighborhood is unique because it is in the heart of Gilbert and just minutes from shopping and area attractions but it’s on a large one-acre parcel & has a rural-feel to it. The barn itself is located on a 1.0 acre property that also has a main house & a guest house. It is private and very secure. You will find that we stock a variety of basic spices such as salt, pepper, garlic powder, as well as Pam cooking spray & some Canola oil, tin foil, saran wrap, plastic food storage baggies, and pump soaps. We provide A STARTER SUPPLY of toilet paper, paper towels, kleenex, garbage bags, dishwasher pods, laundry pods, dryer sheets, coffee filters & coffee, propane for the grill and firepit. Family-Friendly Neighborhood. Close To Downtown Gilbert. Unique, Custom Built Property. Private. Spacious. Safe. Quiet. Outdoor Fire Pit. Heated Spa. Close to Airports, Shopping, Golf, etc..